Fabio Bonizzoni returns with a further Glossa release dedicated to the chamber vocal output of Georg Friedrich Handel: here, a second volume of duets (and trios), which features the vocal talents of Roberta Invernizzi, Silvia Frigato, Thomas Bauer and Krystian Adam. Whilst Handel wrote these small-scale vocal works across his career, this new selection focuses on that astonishingly fertile brief stay that the young Saxon made in Italy from 1707-09 (when he also produced many of the cantatas which Bonizzoni has recorded to great critical success for Glossa). These sensual duets and trios are imbued with Handel�s discovery of Italian � especially the Arcadian � culture, which included him hearing and understanding the music of Corelli and Alessandro Scarlatti. How quickly and successfully Handel developed the chamber duet form is discussed in another of Stefano Russomanno�s detailed explorations of Handel�s music in the booklet essay. 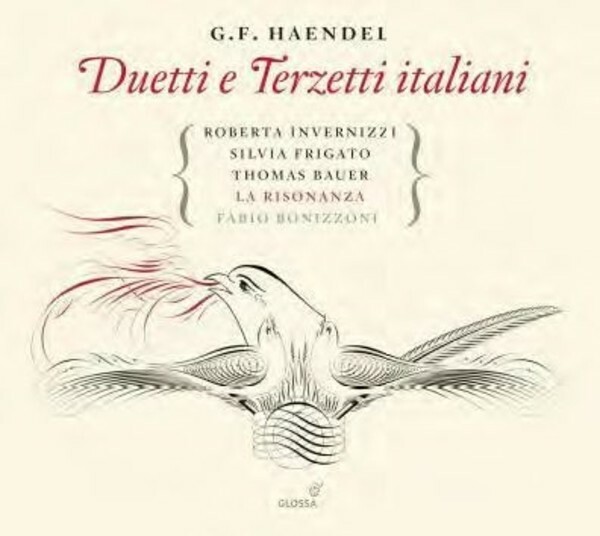 Much of the music for these duets and trios on this recording is scored for soprano and bass singers, and Roberta Invernizzi in particular is afforded another opportunity to demonstrate her magical reaction to Handel�s responsiveness to the Italian language. Not to be outdone in this respect are also the other vocal solists and, of course, the experienced continuo team from La Risonanza: Caterina Dell�Angello (cello), Evangelina Mascardi (theorbo) and Fabio Bonizzoni himself (harpsichord).